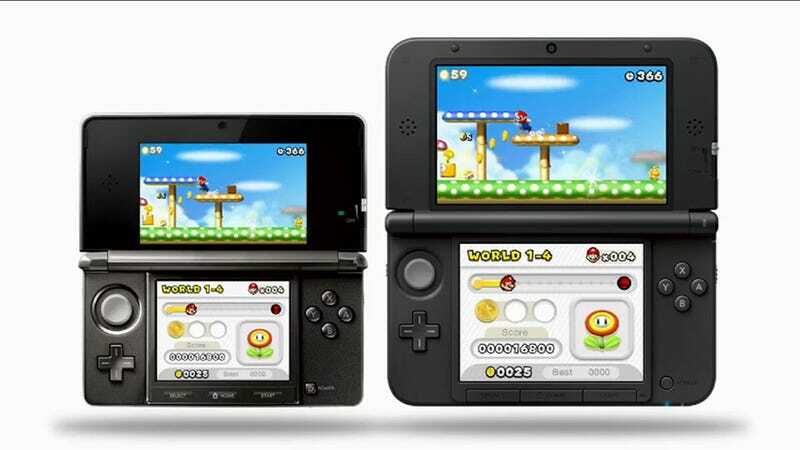 Nintendo Announces a New, Bigger 3DS. Meet the 3DS XL. The screen is 90 percent bigger, with larger bottom and top screens. It's called the Nintendo 3DS LL in Japan and the Nintendo 3DS XL in the West. The top screen measures at 4.88 inches and is 90 percent bigger, while the bottom screen is 4.18 inches and is also 90 percent bigger. Nintendo is packaging the 3DS XL with a 4GB SD card. The 3DS XL will come in three colors (White, Red x Black, Silver x Black) and be out in Japan on July 28 for ¥18,900. The 3DS XL will be out in Europe on July 28. In North America, it will be released on August 19 for US$199.99 in Black, Black x Blue, and Black x Red.